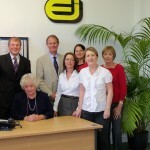 One of the longest established firms of Property Surveyors & Valuers has now been in practising for 80 years. 2011 also marks 20 years of service to the public and local companies by the Partners, Robin Underwood FRICS and Alastair Sharman MRICS Dip HI, since a Management Buy-Out from Birmingham Midshires on 31 May 1991. Moving to new larger premises on Hoghton Street and upgrading our techology has meant increased speed and efficiency for our clients, together with well-trained & qualified staff who provide a top-class friendly service. We specialise in undertaking all types of pre-purchase Survey & Valuation Reports including RICS Home Buyers Reports & bespoke Building/Structural Surveys, Party Wall disputes, Project Management Services (new -build & refurbishment projects) & Expert Witness Reports. Robin & Alastair also advise on property sales that require specialist input from a Chartered Surveyor, such as commercial property, agricultural land/building sales, barn conversions, re-development sites etc. Or why not just call the office for an informal, no-obligation chat with one of the Partners or the Practice Manager, Anne Wareing. Whatever your requirements speak to Edward Jackson. Always here to help.